CHICAGO, IL. — Former Dallas Cowboys quarterback, Troy Aikman, has been named the Keynote speaker at OneShow Opening Session presented by the National Automatic Merchandising Association (NAMA). The keynote event will take place at the opening general session on Wednesday, April 9. Aikman’s speech will follow opening remarks by NAMA Chair Pete Tullio and the annual State of the Industry address from NAMA CEO Carla Balakgie. Brad Sham, the longtime radio voice of the Dallas Cowboys, will also interview Aikman onstage. 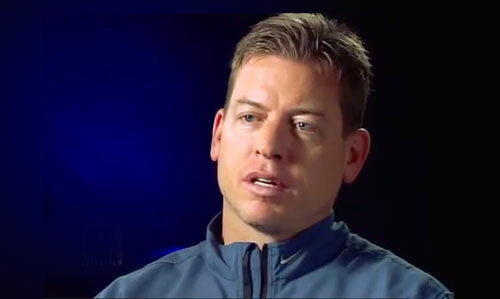 Photo shows Troy Aikman speaking with Chris Myers in a November 2013 interview about his career. Troy Aikman was quarterback for the Dallas Cowboys from 1989 to 2000 and led the team to three Super Bowl victories. He currently works as a television sportscaster for Fox. If you would like to book Troy Aikman for a speaking engagement or appearance, contact Troy Aikman’s booking agent for appearance & speaker fees.